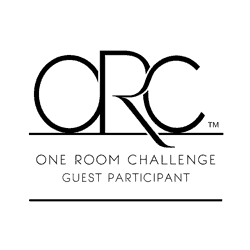 It’s the reveal week for the One Room Challenge, so it’s pretty much like Christmas day in blog land! There are so many beautiful rooms to check out. 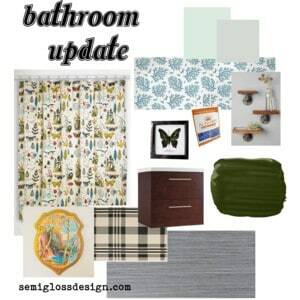 Today, I’m sharing my Moonrise Kingdom inspired bathroom that I’ve been working on for 6 long weeks. If you’re new here, we bought our house in central Maryland about 2 years ago. We’ve been working non-stop to update it and make it feel more like us. In the spring, we completed our kid’s treehouse and now we’ve completed a bathroom! 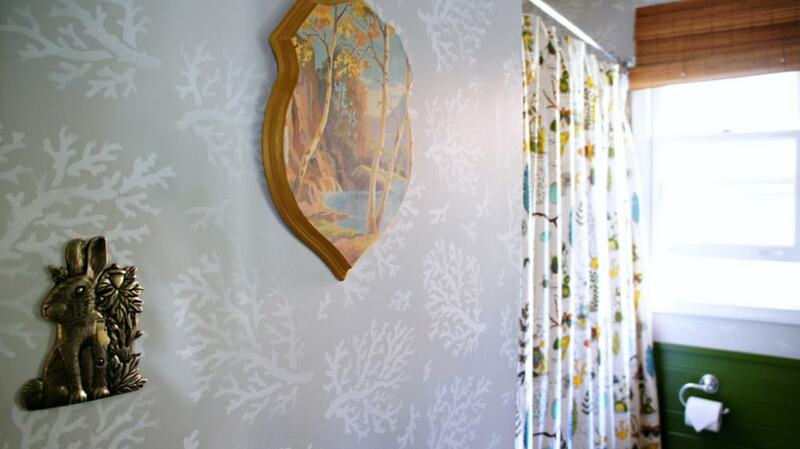 When we first bought the house, it was filled with wallpaper and dark wood tones. Luckily the tub and tile were nice and in good condition. White tile in a tub is always going to be a good thing. I made some temporary changes by removing the wallpaper and painting. We eventually replaced the vanity, so we were left with a hole in the vinyl flooring where the old one used to sit. This hole combined with messy kids meant that it needed to be fixed. 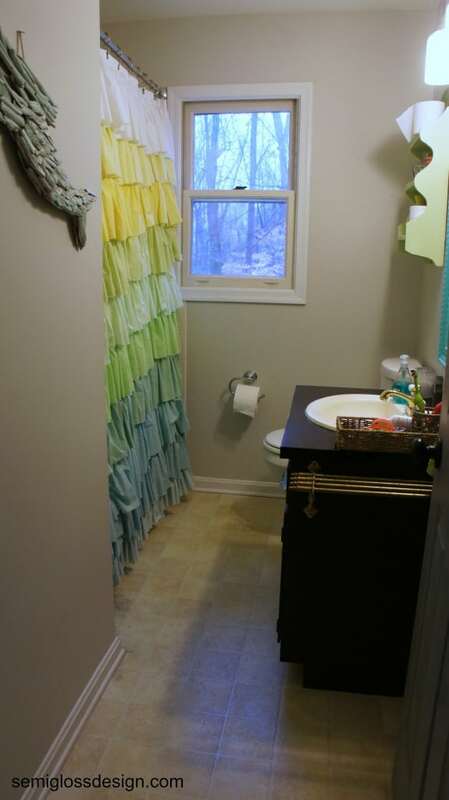 The bathroom plans were inspired by the lovely kitsch of Camp Wandawega and the colors from the movie, Moonrise Kingdom. It’s come such a long way! The shower curtain was my starting point. The details and colors are so perfect. To me, it’s almost like a big piece of art. Bonus feature: you can learn the Latin names for flora and fauna while in the bathroom! I love the shower curtain so much with the tile. 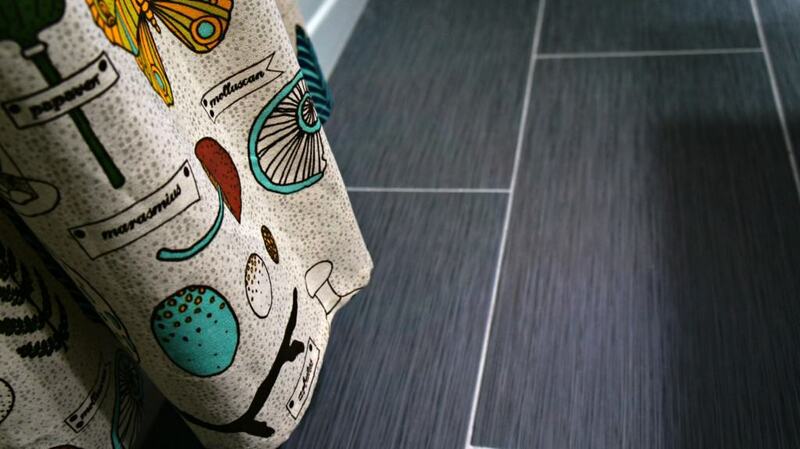 The tile has subtle stripes that remind me of linen. 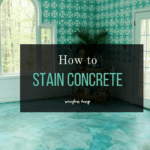 It’s so much better than the gross vinyl flooring from before. A close up of the tile and shiplap before I caulked. The tile always looks clean, even though we have black lab that sheds like crazy. 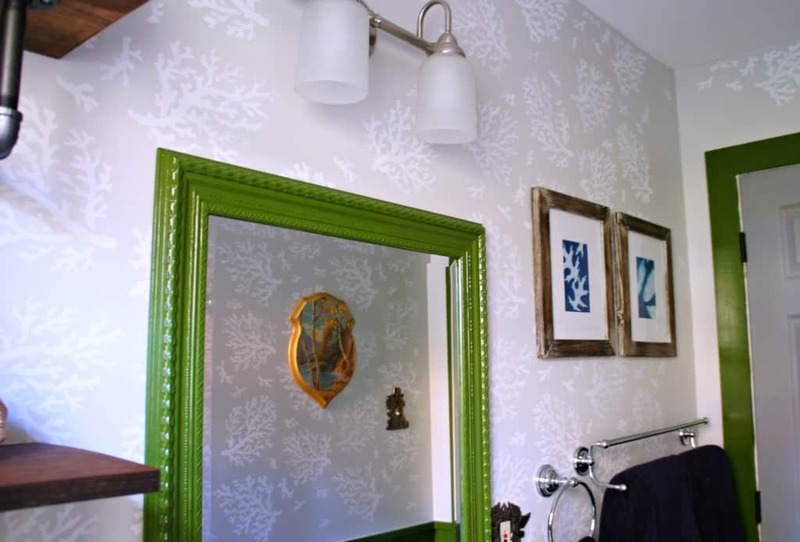 The stenciled walls provide such a happy backdrop for all of the other elements. The bunny light switch never fails to delight me. An item that is used this much should be beautiful! The paint by number art is so amazing. The picture is printed on the wood and the edge is painted a lovely shiny gold. I made the sunprint art with leaves from the trees in my backyard. The paper turned such a pretty color of blue! The art is meaningful and will always remind me of autumn in Maryland. I painted the existing mirror green to match the shiplap. I like how you can see most of the art in this picture. The leaf plate is a thrift store find. It has the prettiest crackle in the glaze. It’s there to hold random hair bands, bracelets and stray Legos. The new toilet is so easy to clean (I’m sure moms of boys can appreciate that!) The industrial shelves add storage as well as a place for display. It’s my mini cabinet of curiousity! We also added bamboo blinds to make guests feel more comfortable. I added a few fun items for display here, like this skull that my dog brought me. Isn’t she sweet? Be sure to check out the reveals from the featured designers and all of the guest participants as well! it looks awesome! 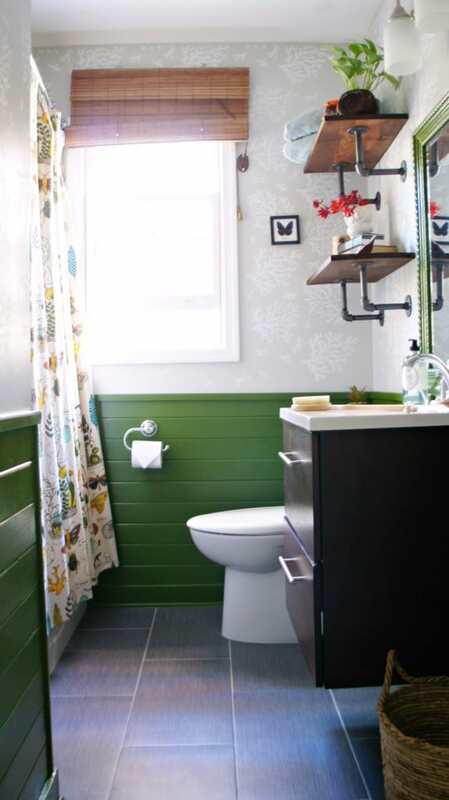 i LOVE the tile and those shelves, and i love that you went bold with the green! it’s such a fun bathroom! Thanks Cassie! Its so funny because I never would have used green a few years ago! Thanks so much! I’m super happy with this space. I’d love to join you Ariel! Wow, this is so good! I love the green – it really sets the tone for the space. Btw, we have that toilet (with a little guy ourselves) and love it! Wow, Emy, it really all came together so beautifully! 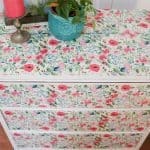 The stencil is subtle enough to blend yet still a feature! The shower curtain is so fun! I love the warmth the bamboo blinds add and you know I adore your industrial pipe shelves! Gorgeous!!!!! Thanks Kari! I’m so happy with it! Emy…you did it! Doesn’t it feel good? 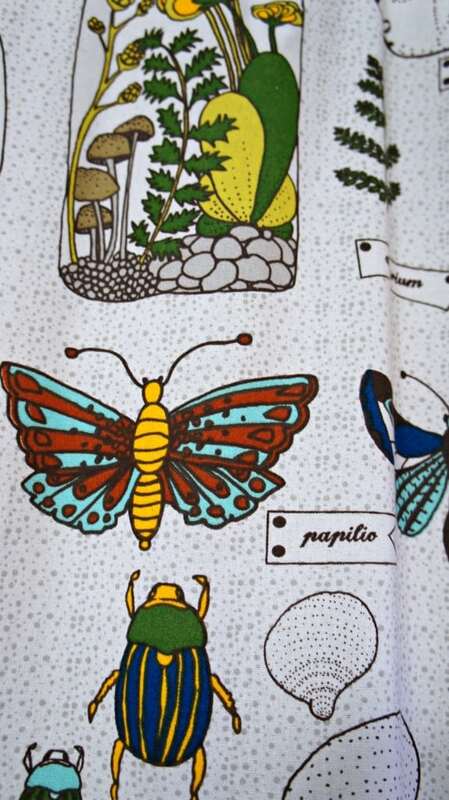 That shower curtain is just lovely…you could do so many things with it! It looks great with the tile floor and the green wall. And I love those shelves you put together. All in all, I’m thinking that going to the loo is a lovely experience in your house. Emy, this turned out so great! The tile is obviously awesome 😉 but I am so crazy for the green shiplap- the whole room is so special! Hi Edy. The bathroom looks lovely! That shower curtain is really beautiful! I am a fan of bright colors so I like it a lot : ). Great job on the stenciling as well. Thanks Delia! Bright colors make me happy. SUPER fun, colorful and quirky. Some of my favorite things 🙂 Congrats on a super transformation! Thank you so much, Heather! It feels good to be done, doesn’t it? Oh my goodness, I just love this! Especially the Moonrise Kingdom inspiration – love Wes Anderson! I recently completed a Royal Tenenbaums-inspired kitchen makeover over here myself 🙂 Love your choices in this space! Wonderful job! Oh gosh. I’ve been clicking through all the links in the link party and it didn’t register that this was your blog! Of course! Total brain lapse over here, Emy! 🙂 Haha, no problem! Thanks Brynne! Wow, what a transformation Emy! I love all the pops of green. It’s so stunning and fun and bold! I seriously love it! Your bathroom is fabulous! I love the deep green color and the shower curtain…so cute!! I love all of the green!! 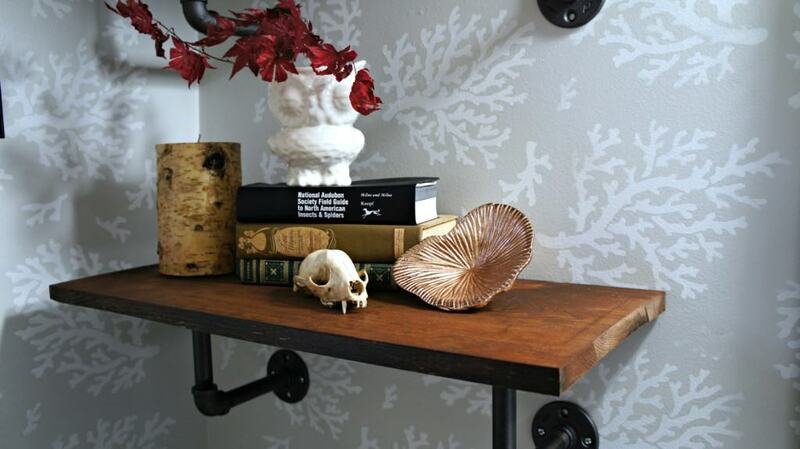 The vanity and pipe shelving are so great in the space! Enjoy your bathroom! Way to go Emy! This looks great – we especially love the green hue and the industrial shelving! Thank you so much Vicki and Jennifer! 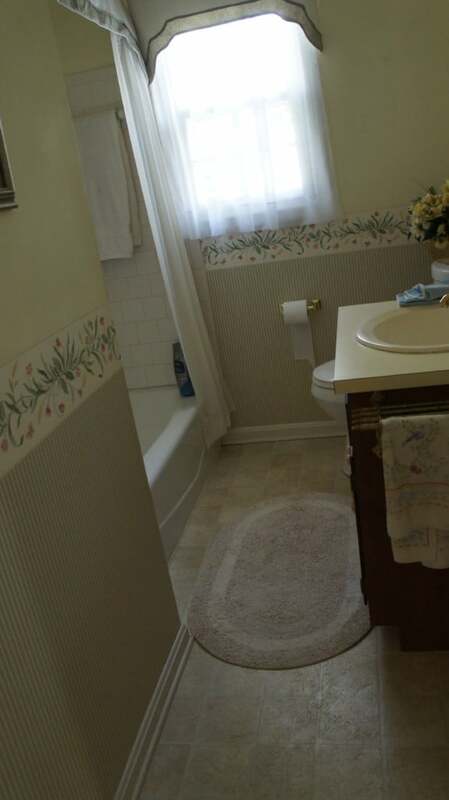 What a beautiful transformation in this bathroom. The tile is gorgeous. Sounds like there are many meaningful items which always adds the personal touch. Great job! Those walls!! 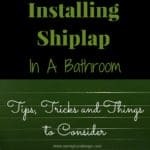 That shiplap!! That floor!! Wow! I am just loving this entire room reveal! Congrats on an awesome job! Emy, It looks wonderful! I love the tile, shower curtains, bamboo shade, the green shiplap and mirror, stenciled walls and those gorgeous industrial shelves. OK, I love it all!! Beautiful job. What a cheerful and bright space. I absolutely love your use of color- and all of the creative touches. 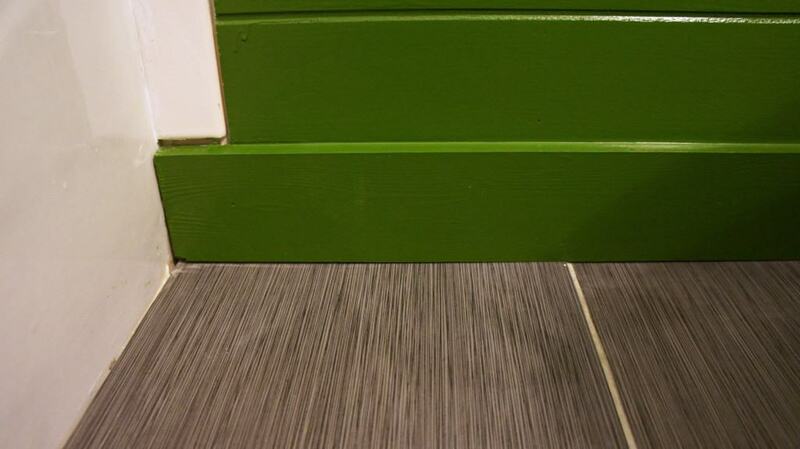 I just used a bright green in my sons bathroom and love it. What a great transformation! 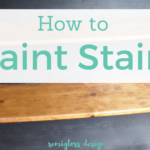 It turned out so good, and the green shiplap is amazing! 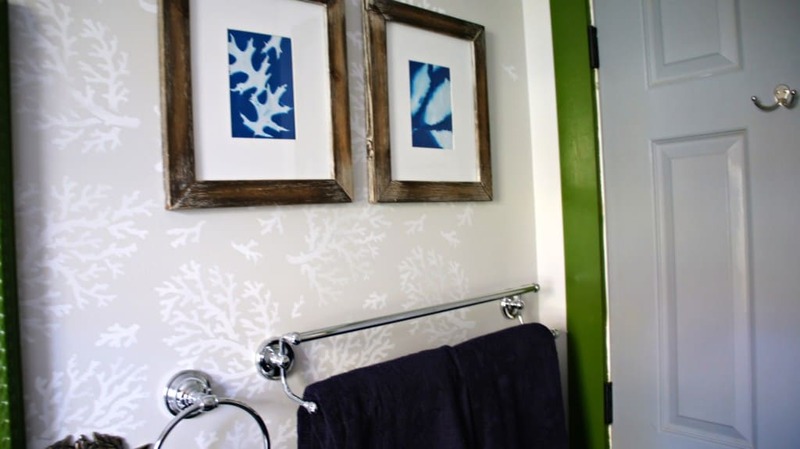 i love your bathroom makeover, Emy! 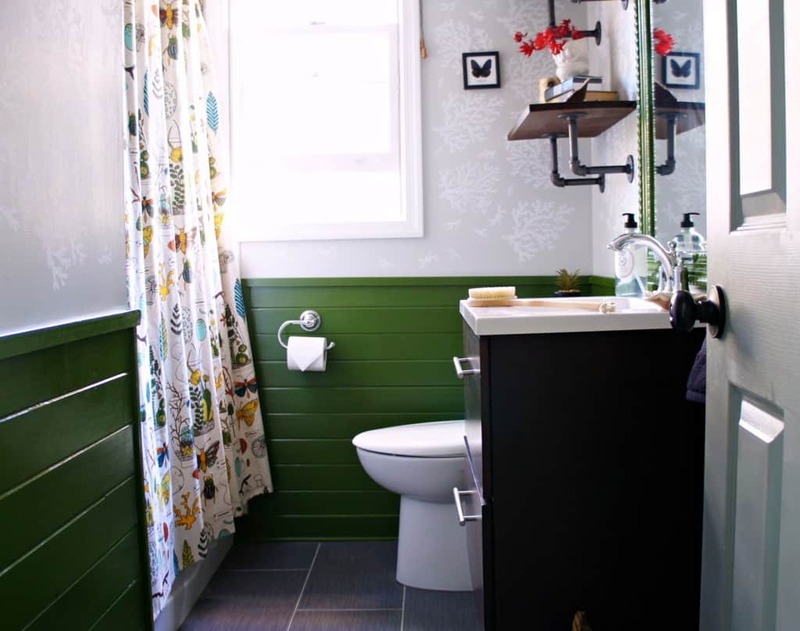 Love the the green in this space (awesome shower curtain). The floor tiles came out so nice too. What a transformation. Congrats! 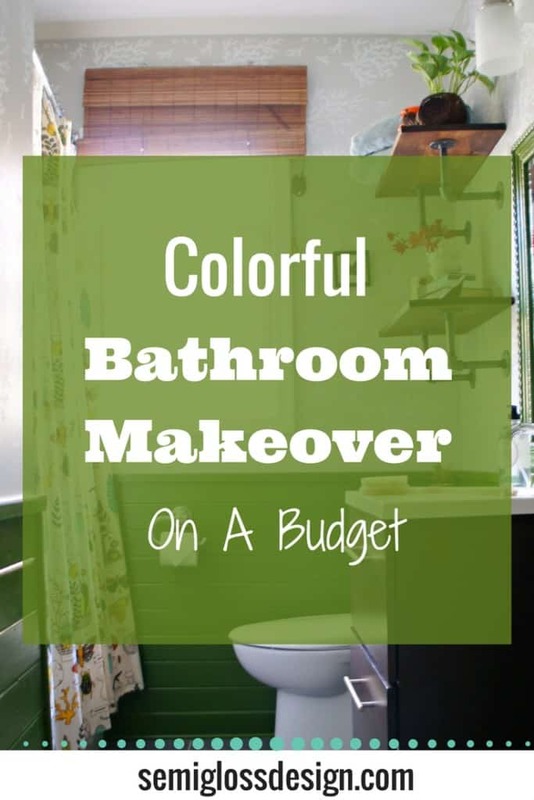 Awesome makeover…..love the green and the shower curtain! Thanks so much, Sherry! I really love your bedroom and bathroom update! 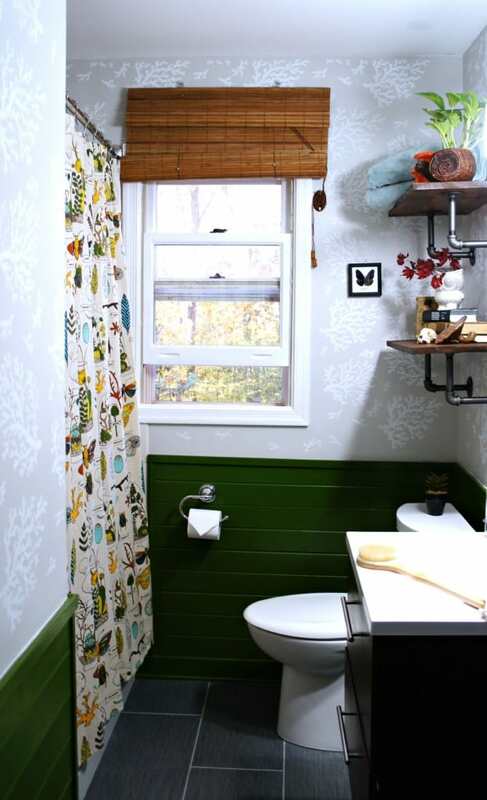 i love all the pops of green and the fun shower curtain! congrats! This is such a fun space! I love all the detail! 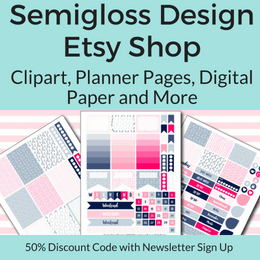 What an amazing starting point – I LOVE that shower curtain! 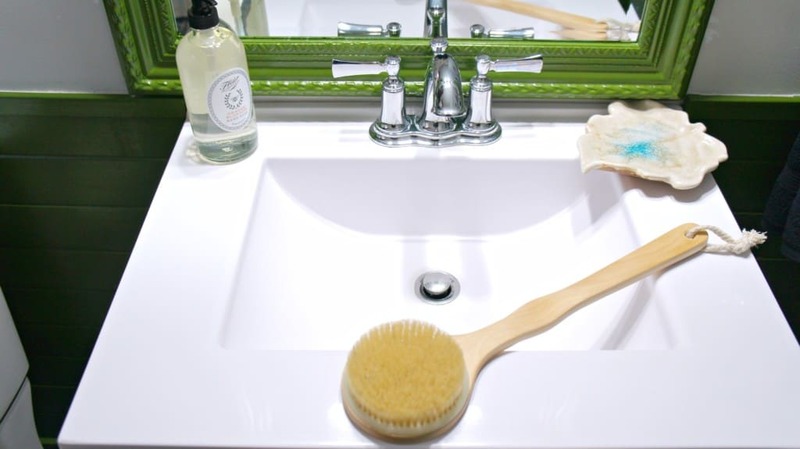 You completely transformed your bathroom and it looks amazing now. Job well done!